IMCDb.org: 1961 Renault 2,5T Galion 4x4 Sinpar VIR 1001 B [R2240] in "Sous le signe du taureau, 1968"
Not in the range 750Kg/1000kg , but bigger 2,5T Galion. Aren't Galion and 2,5T an unnecessary repetition (1), the same way Sinpar and 4x4 can be? 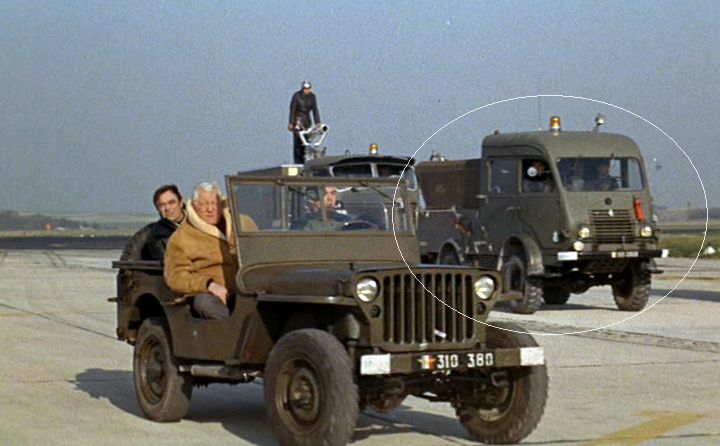 which one is really this one, as the scene seems to take place on an airfield? 1: all the more as the 2,5T has been renamed Galion from 1959 onwards. As this one is said to be a 1961 model (on what clues? ), should it still have 2,5T in its name? There is at least one point of interest in naming one of these Renault "2,5T" and "Galion" (as far as it is correct to call them Galion): it makes the search easier, when one have, for any reason, to extract all Renault 2,5T used, whatever their code number or their official name at the dealers' be. Shouldn't we call them 2,5T/Galion, then, to show that these names are 2 possibilities (like C/K for GM trucks)? The way it is written for now gives the impression that it is a single name, which is (as far as I know) impossible. See the note in my previous comment.